What happens after the death of a marine tetrapod in seawater? Palaeontologists and neontologists have claimed that large lung-breathing marine tetrapods such as ichthyosaurs had a lower density than seawater, implying that their carcasses floated at the surface after death and sank subsequently after leakage of putrefaction gases (or ‘‘carcass explosions’’). Such explosions would thus account for the skeletal disarticulation observed frequently in the fossil record. We examined the taphonomy and sedimentary environment of numerous ichthyosaur skeletons and compared them to living marine tetrapods, principally cetaceans, and measured abdominal pressures in human carcasses. Our data and a review of the literature demonstrate that carcasses sink and do not explode (and spread skeletal elements). We argue that the normally slightly negatively buoyant carcasses of ichthyosaurs would have sunk to the sea floor and risen to the surface only when they remained in shallow water above a certain temperature and at a low scavenging rate. Once surfaced, prolonged floating may have occurred and a carcass have decomposed gradually. Our conclusions are of significance to the understanding of the inclusion of carcasses of lung-breathing vertebrates in marine nutrient recycling. 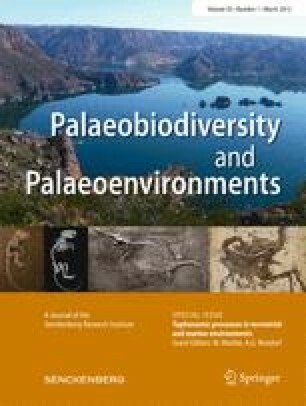 The postmortem fate has essential implications for the interpretation of vertebrate fossil preservation (the existence of complete, disarticulated fossil skeletons is not explained by previous hypotheses), palaeobathymetry, the physiology of modern marine lung-breathing tetrapods and their conservation, and the recovery of human bodies from seawater. This article is a contribution to the special issue "Taphonomic processes in terrestrial and marine environments"
We thank R. Allenbach, H. Benke, R. Böttcher, J.K. Broadrick, D. Flentje, M.C. Haff, J. Hermann, J. Hürlimann, T. Keller, F. Lörcher, S. Lutter, J.H. Modell, M.D. Pirie, K. Schneider, R. Schoch, Y. Song, B. Springmann, M. Stede, D. Trottenberg, M. Wuttke, J. Zopfi, Institut für Rechtsmedizin der Universität Basel and WWF Bremen for their input. D.M. Martill and an anonymous reviewer critically read the manuscript and made helpful suggestions. Two anonymous colleagues kindly reviewed an earlier version of this article. This research was supported by a grant from the Swiss National Science Foundation (to A.G.R. and A.W.) and Freiwillige Akademische Gesellschaft Basel (A.G.R.). All these contributions are gratefully acknowledged.